In 2015, the United Nations General Assembly adopted a universal Agenda for Sustainable Development, calling on all nations to mobilize global efforts around a common set of 17 Sustainable Development Goals, or SDGs. While the pre-2015 Millennium Development Goals addressed different economic, environmental and social issues separately ‘in silos’, the 2030 Agenda for Sustainable Development has brought about a more holistic way of looking at development issues, recognizing that “social and economic development depend on the sustainable management of our planet’s natural resources”. Sustainable food systems are both a means and an end towards achieving the SDGs. With demand for food and other agricultural outputs (eg. biofuels) projected to increase by at least 60 percent (above 2006 levels) in 2050, a world where food is sufficient, safe, affordable and nutritious is one of the biggest challenges facing the 2030 Agenda for Sustainable Development. The challenges of feeding a growing and more prosperous world population are currently being met by degrading our planet’s ecosystems. Indeed, more than one year after the announcement of the Sustainable Development Goals, short-term stability still prevails over long term resilience. The case for incorporating the value of biodiversity and ecosystems into food value chains is increasingly being made as we are approaching and crossing ecological thresholds and environmental tipping points. However, we have to move beyond the incremental and patchy redesign of our agricultural and food systems; systems in which the values of ecosystems, biodiversity and human health are fully accounted for in public and private decision making. The UN 2030 Agenda for Sustainable Development (Agenda 2030) envisages a world “free of poverty, hunger, disease and want, where all life can thrive… and a world where food is sufficient, safe, affordable and nutritious.” Achieving Goal 2 (Zero Hunger) and Goal 12 (Responsible Consumption & Production) will depend on a range of actions encapsulated in multiple SDGs. 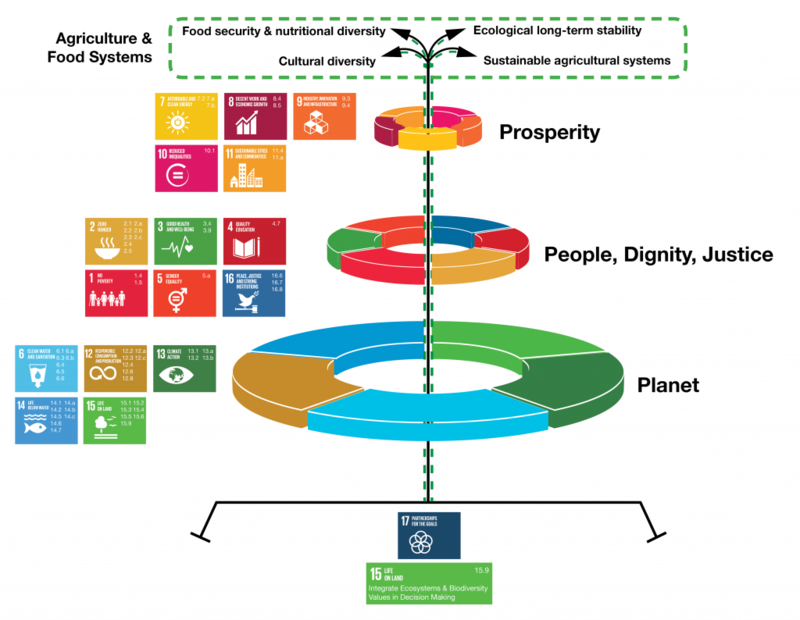 To scale-up delivery of the SDGs, TEEB suggests using a “three tiered” structure for the 17 SDGs as opposed to the “flat” structure of the usual presentation of the SDGs. This way of representing the SDGs emphasizes that our planet’s natural resources underpin delivery of the entire 2030 Agenda for Sustainable Development. By visualizing the interlinkages, synergies and potential trade-offs within and between the SDGs, we demonstrate that the SDGs are indivisible and should be implemented in an integrated manner. The successful implementation of target 15.9 –integrating the value of ecosystem and biodiversity values into decision making– is an enabling factor that connects the dots between different goals and targets. The SDGs food cake addresses the interdependent food system challenges towards a balance that is good for “People, Planet, Prosperity, Justice and Peace” –the key words at the heart of the SDGs. Agreeing upon the SDGs and taking a more holistic approach to food system challenges was a success, but that was the easy part. Achieving the goals will require transformative action and changes in how and where we produce food, and what we eat. SDG policy action reconciles food system concerns such as food security, social (and gender) equity, nutritional diversity, and equal access to natural resources. The consequences of the economic invisibility of costs and benefit flows from agricultural and food systems call for new ways of measuring success. The 2030 Agenda is committed to “developing broader measures of progress”, going beyond the common yardstick of GDP growth and financial profits. The TEEBAgriFood project will identify and conceptualize the hidden costs, benefits and interdependencies of current food systems. 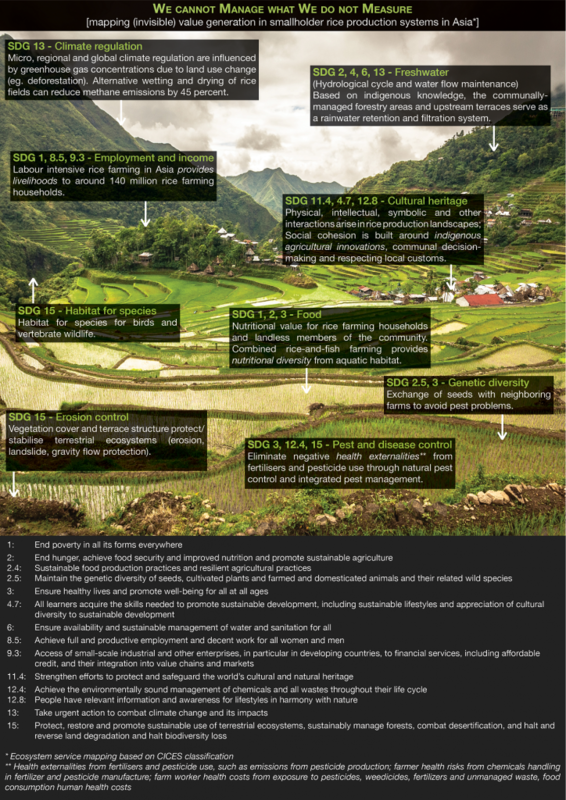 By tracing out a universal food system “Valuation Framework”, the TEEBAgriFood project provides a tool for the holistic implementation of the SDGs. The project will advance an “open architecture” of partnerships between policy makers, academia and civil society. 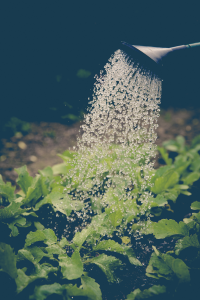 By bringing together a wide range of interdisciplinary fields we can transpose scientific evidence into policy action toward an equitable, effective and low-input food system and a regained balance that is good for “People, Planet, Prosperity, Justice and Peace” .